It’s not that hard to think how important coffee is to our everyday lives and for many people it is no longer a novelty and they simply switch on the coffee maker or buy a cup of coffee out of instinct. In the US alone coffee stands are making a hefty profit from people buying coffee every morning and it is also a great source of profit for restaurants that like to serve breakfast. In this tough economy, you could be saving a lot of extra bucks by simply having your very own stainless steel coffee mug and filling it up at home. While a cup of coffee is not expensive, it definitely starts to add up after a while and this is especially true if you start getting addicted to coffee. We have decided to find the best travel coffee mugs that will help you have a lot of time and make your early morning routine a little less expensive. The travel mugs are easy to use and they are quite large to help you save those extra dollars on one or two cups of coffee every day. But before we look at the top stainless steel travel mugs, there are a few things that you need to be aware of before buying and by taking these features into account; you will be able to get more multifunctional use out of these best travel mug to keep coffee hot for hours. By taking note of these features, you will be able to make a better choice on your next coffee mug and you can be sure that it is a high-quality product. The price will also be a good indication of the quality and sometimes it is not better to choose the cheaper item over quality. 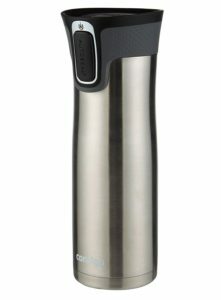 The Contigo auto seal west loop coffee mug is packed with great features and it is also available in multiple sizes depending on your coffee consumption. 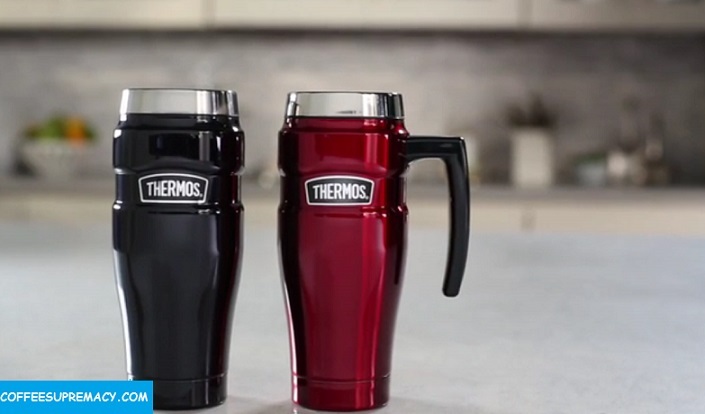 The travel coffee mug features an auto sealer in the lid and this will ensure that you do not spill anywhere and it can even be turned upside down without spilling a drop. The Thermolock ability is one of the newest methods of ensuring that the coffee stays hot on the inside. When this is combined with the stainless steel outer frame, you can be sure that your coffee will stay hot for prolonged periods of time. Furthermore, the drinking nozzle is quite unique and it will ensure that you can use this coffee mug anywhere you co and drink coffee without a mess. The coffee mug is great for multifunctional use and in the hot summers it can also be used to store your water and keep it cold for longer periods of time. 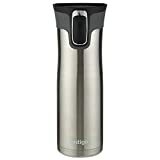 The stainless steel construction id durable and the cold will be kept inside longer if you have refrigerated the mug. We definitely recommend this cup for anyone that likes to travel or anyone who loves that cup of coffee every morning. This mug is available in multiple sizes ranging from 16 ounces to 24 ounces. The drinking feature on this lid is quite large and you will be able to drink quite comfortably while ensuring that no spillages occur and that you have a nice clean and fresh tasting cup of coffee every morning. 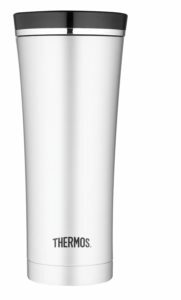 Featuring a stylish new and unique design, the Thermos stainless king can be considered as an upgrade to many of its predecessors. The coffee mug is made from durable stainless steel, but the rubber exterior makes it easy to carry around when you have extremely hot or cold liquids on the inside and the added handle will allow you more functionality when carrying around the mug. The leak proof drinklock lid feature has been incorporated to eliminate any possible spillages and to ensure that you have an easy drinking experience. 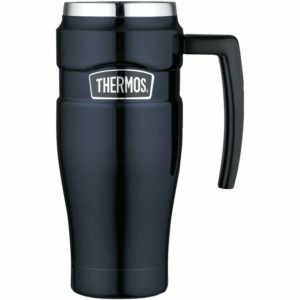 Furthermore, you will be able to add hot or cold liquids to the mug and the mug will be able to retain the respective temperatures for a prolonged period of time and this will allow you to use the mug as a water bottle for a full working day. On the downside, we have to look at the price, but we believe that this could be seen as an investment and that you will be able to get multiple years of use out of this mug. The mug will also save you a lot of money and you will no longer need to buy those coffee stand coffees every morning. Finally, we have a stainless steel travel mug for the huge coffee lovers and the lazy people as well. This large 30-ounce coffee mug will be great for keeping a full mornings’ worth of coffee and to ensure that you are fully energized throughout the entire day. The mug is really affordable and it will allow you to store hot or cold beverages inside while maintaining the temperature for a prolonged period of time. The only downside to this huge mug is the weight and once filled up it will be rather heavy to carry around. We definitely recommend this for the big coffee lovers and you can be sure to save a few extra bucks by using this mug instead of buying beverages on your way to work every morning. We would like to thank you for reading this article and we believe that you now have the knowledge to buy your next stainless steel travel coffee mug and ensure that you buy a quality product. We hope that you have seen that not all of these mugs are the same and that they have multiple different functions. We would like to encourage you to let us know what you think of these mugs and to tell us of any other cool travel coffee mugs that we might have missed and you believe are high-quality. Next story How to make a Coffee Frappuccino Drinks at Home?